The MTA World Vet Championship is in its 25th year of competition. It has been won by some of the greatest names in motocross history (J.N. Robert, Gary Jones, Thorlief Hassen, Rex Staten, Eyvind Boyesen, Jeff Ward, Andy Jefferson, Warren Reid, Kent Howerton, Erik Kehoe, Ron Turner and Rich Thorwaldsen), but one name stands out from all others—Doug Dubach. 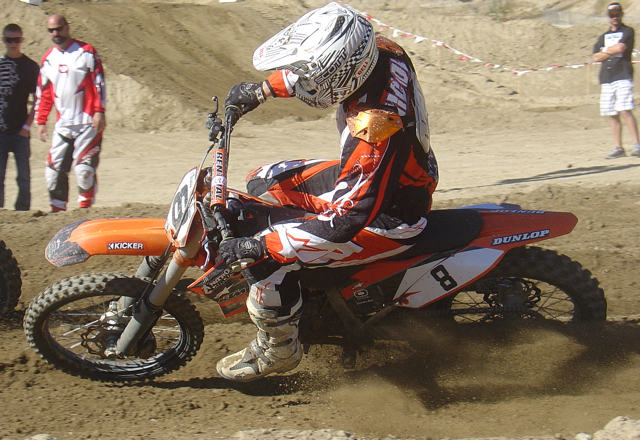 Dubach has won 11 Over-30 World Vet Championships and six Over-40 titles. 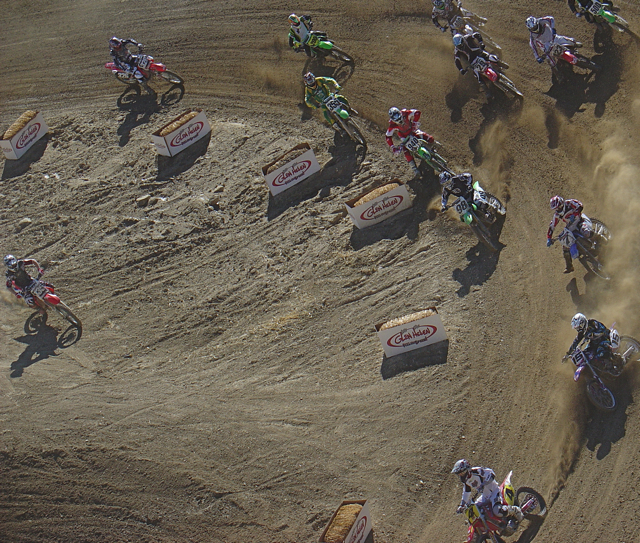 The photo at left shows how big Doctor D's lead was in the first moto of the Over-40 World Championship. His arch nemesis has been Ryan Hughes. Ryan has won the Over-30 crown three times and would have won it several more times, but has suffered a spate of bad luck. Last year while winning, the ignition wire on his CRF450 came loose. 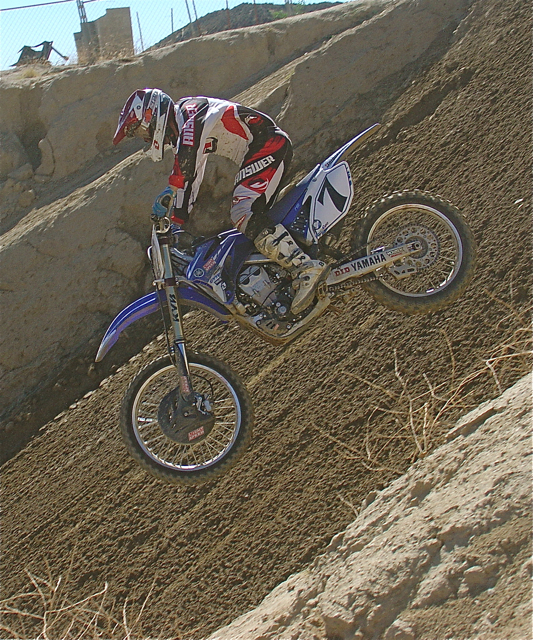 Victor Sheldon (200) was eighth overall in the Over-30 Pro class. This year, Ryan got a flat tire while leading moto two. Never one to give up, Ryan soldiered on with his flat rear tire...and just might have been able to hold onto the lead if the tire had stayed on the rim. It didn't. Ryan had to make quick pit stop and fell back to sixth place. Dubach pounced on by for the win. But, Doug didn't know he had won because he hadn't seen Ryan pull over for the pit stop. It wasn't until he crossed the line and mechanic Alan Olson gave him the Number One sign that Doctor D knew what had happened. 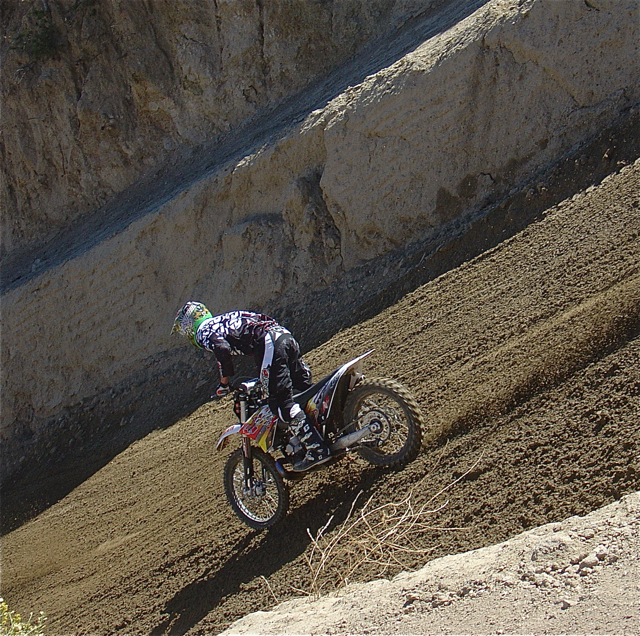 Photos don't do the steepness of Glen Helen's hills justice, but Paul Temmerman can confirm how steep they are. Other notable: 12. Matt Smith...13-11; 13. Ed Foedish...12-16. Ryan Hughes (4) holeshot both Over-30 Pro motos with Doug Dubach (15) behind him. Danny Carlson (135) uses a line that can only be considered cheating. Dubach won the Over-40 Pro race on Saturday and the Over-30 Pro race on Sunday. He pocketed several thousand dollars, but most of all—he took the coveted double Pro class win (and capped his record at 17 titles). Zoli Berenyi, Sr. has 12 wins in the Over-50, Over-60 and Over-70 classes, while Dubach's mechanic Alan Olson holds nine titles (from the Over-40, Over-50 and Over-60 classes). England's Greg Hanson chases Venezuela's Pedro Gonzalez in the Over-40 Pro class. Other notable: 14. Greg Hanson...4-25; 15. Pedro Gonzalez...25-5; 18. Nick Bell...19-18. Kurt Nicoll almost won last year, but broke a wheel. This year he was a consistent third in the Over-40 Pro class. Over-50 Expert: Canada's Pete DeGraaf went 1-1 to win the Over-50 World Championship. It was DeGraaf's second title. He won the Over-50 crown for the first time back in 2007. 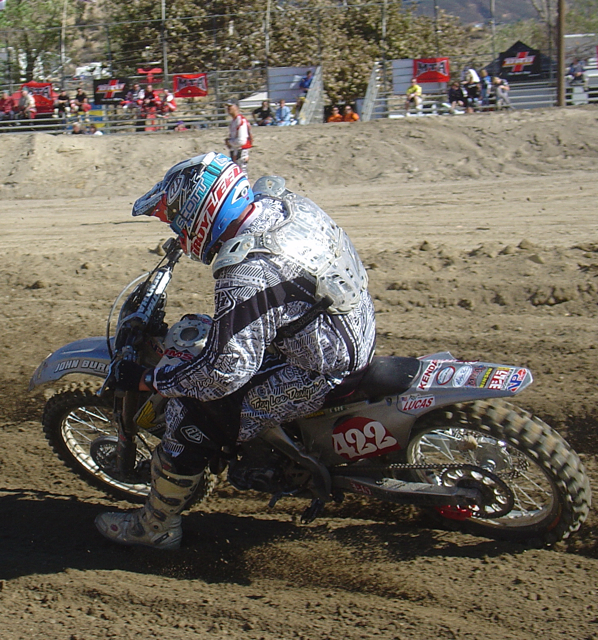 Pete Murray, the 2000 Over-40 Champion, was second with a 3-2 with Loretta Lynn Over-50 Champion Matt Tedder (2-5) third. Other notable: 13. Isao Ida...4-24; 14. Gert Van Rhee...17-12; 17. Antonio Berrocal...20-16; 20. Jan-Einar Oxelmark...18-25. 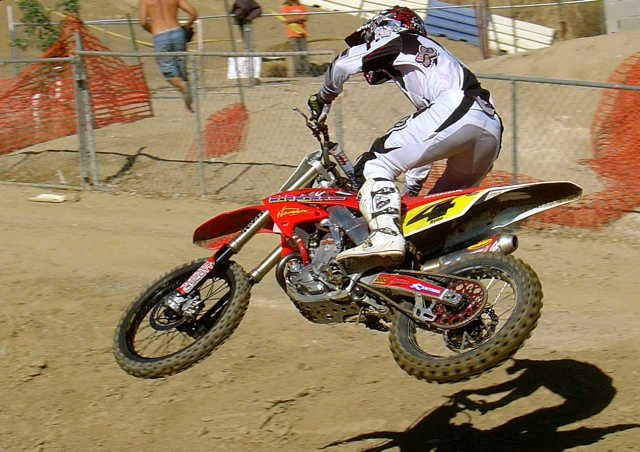 Four-time 250 National Champ Gary Jones (1971-1974) raced his Silver Surfer CRF450 to seventh in the Over-50 Expert class. Over-60 Expert: The battle for dominance in the Over-60 World Championship boiled down to three riders: 2007 Over-60 Champ Bill Maxim, 2006 Over-60 World Champ Terry Sage and 1990-2000 Over-40 World Champ Hideaki Suzuki. There were other contenders in the field, including the Swedish contingent of Lars Larsson (2001 Over-60 World Champ) and Bengt Johansson. Last year's Champ, Thorlief Hanssen, couldn't make the trip to defend his crown. Terry Sage won the first moto with Maxim second, Suzuki third, Steve Machado fourth, Lars Larsson fifth and Vic Curti sixth. 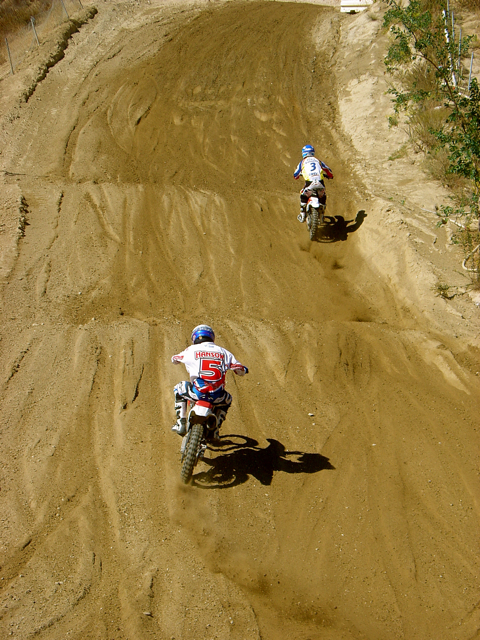 At the start of the second moto, Hideaki Suzuki and Bill Maxim traded the lead, while Terry Sage chased. Finally, Maxim forced his way past the former Japanese National Champion for good and Sage went by with him. 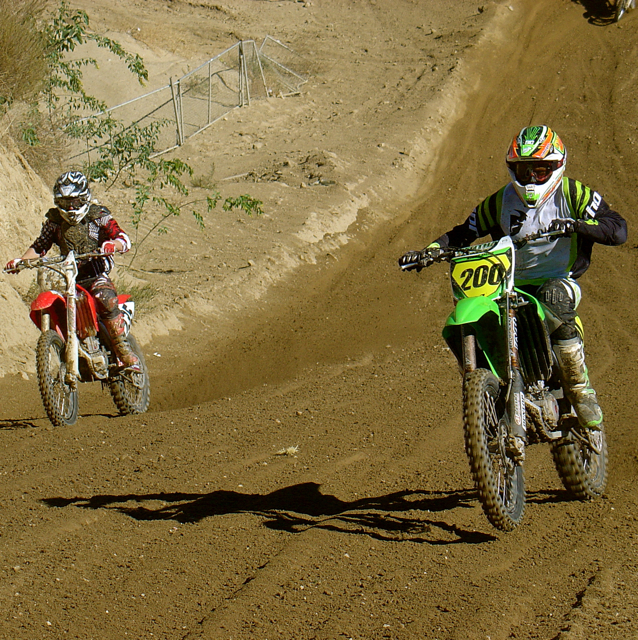 All Sage had to do was pass the American desert racer (who, amazingly, was riding his 300-pound Honda XR650 Baja bike). It didn't happen. Bill Maxim rode away with the win. Ryan Hughes had the speed, but he lacked the luck. Over-70 Expert class: The Over-70 class has had World Championship status since 2001 when it was won by the legendary Feet Minert. It's hard to believe that Feets could still be competing eight years later, but the 78-year-old finished second to Oklahoma's very popular Jimmy Redwine. Redwine's 1-1 beat Minert's 2-3, Gary Anderson's 4-2 and Chuck Ramsey's 3-4. Meanwhile, last year's Over-70 Champ Jerry Harpole couldn't answer the bell. Over-30 Women: Former Kawasaki factory rider Larry Wosick's sister Lynette Wosick swept the Women's class in front of Brooklyn McLendon and Nicci Danyluk. Tony Amaradio was fifth in the Over-30 Pro class behind Austin Squires, but in front of Australian Mick Cook, Danny Carlson, Victor Sheldon and Paul and Dieter Temmerman.